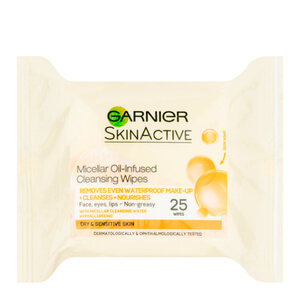 Gently cleanse and refresh your complexion with the Garnier Vitamin Enriched Cleansing Wipes. Infused with plant extracts, the vitamin-rich face wipes effortlessly diminish dirt, impurities and make-up, including waterproof mascara, without rubbing, over-drying or uncomfortable tightness. Suitable for sensitive skin types that are easily irritated, the wipes contain two doses of cleansing milk to leave skin clear, soothed and radiant. E.N. Perfume, alcohol and colourant free.